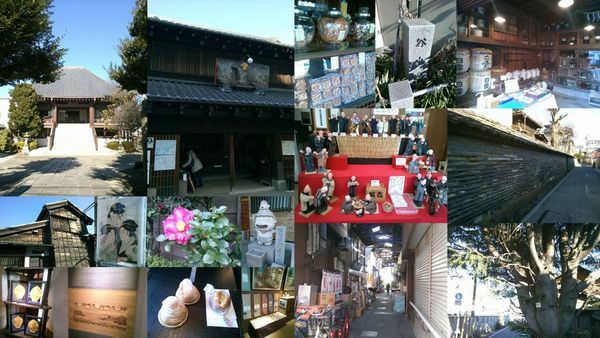 ICT Seasonal Event 4, Yanaka One-Day Trip: Off to nostalgic Japanese streets for food, art, crafts, old-fashioned architectures, show, history and much more. When you think “Tokyo”, it might remind you of tall buildings and high-technological city. But you would think it again after hanging out at Yanaka, where nostalgic scenery still remains. ・It’s a dense zone of temples and shrines with some slight slopes. ・Funny and comedic puppet show will give you laughs in a Japanese traditional way. ・Tsuiji-hei, a rare and unusual wall which consists alternately of clay and tiles. ・Ogura-ya, an old pawnbroker’s house, shows its artistic works and souvenirs such as postcards, stickers, picture stands, hanging scrolls for postcards and others. The house consists of wooden frames, plaster walls and tiled roofs. And its base has been already built about 200 years ago. ・Allan West gallery, where an American painter draws pictures in Japanese style, make our trip even more enjoyable. You will find plenty of spots worth seeing in Yanaka and will probably meet something lovely which you haven’t seen. We are looking forward to seeing you at the event. Yanaka, between Nippori station and Ueno station. We don’t take enough time for lunch (around 12pm), so please fill your stomach with tasty local food at Yanaka-Ginza during Free Time! Outside of west ticket gate in JR Nippori station, at 10:30am on February 23rd. Please don't be late, we'll be leaving JR Nippori St. at 10:35pm!!! Note: NOT included street foods, drinks and tea/coffee in the café. Please be considerate and change your RSVP at least 24 hours before the meetup so that other members have a chance to RSVP. * If you cancel the event, please email Jojo at info@intlcentertokyo.com after Feb 8th! If you send your email address or phone number to organizers before the event, we will reply you with contact details. Email Jojo at info@intlcentertokyo.com if you get more information!